There isn’t a lot of fall weather that goes on in San Diego. In fact, the temperature last week was higher than it was for most of the summer. But that hasn’t stopped me from craving my favorite fall foods. Especially when I read posts on Facebook from all of my friends back in Ohio, which is exactly how I came across this recipe for Stuffed Acorn Squash. It’s not something that I have ever made before, but I could tell by the ingredient list it was a winning combination. The squash adds a mellow flavor with just a touch of sweetness that balances perfectly with the somewhat spicy sausage. As with the Asian Lettuce Wraps, I was wary about using the apple. Typically fruit and savory is not a combination I like, but it works in this so don’t be afraid. Jesse kept asking, “What’s in this? It’s really good”. Which is always is a good sign. Really quick before I get to the recipe – Today is the day that Jesse heads out for another month in China. Please excuse me while I cry like a baby having candy taken away. You’d think that maybe it would get a little easier each trip, but alas, it has not. Don’t get me wrong. I’ll be OK. I’ll do what I did last time and keep myself busy and honestly a month is a whole lot shorter than his last trip. 4 Mondays. Totally doable. Now that my temper tantrum and pep talk are over, I’ll move on to the post. Combine the melted butter, garlic, and 1/4 tsp sage. Brush the inside and outside of each squash with the butter mix. Place the squash on a cookie sheet, cut side up, and roast for 50-60 minutes, or until fork tender. In a large skillet over medium heat, brown the sausage. When the sausage is browned, remove it from the pan and place on a paper towel lined plate, set aside. To the skillet add the onions, celery, and mushrooms and cook for 3 minutes. Add the apples and cook for another 2 minutes. Return the sausage to the skillet then remove from heat. Season with sage, salt, and pepper. Stir in the panko and Parmesan. Add the egg and stir to combine. Divide the stuffing evenly among the four squash halves. Return to the oven and bake for another 20 minutes. Serve with extra Parmesan for garnish. >I grew up on this in Michigan! I forgot about stuffed acorn squash. Unfortunatly I do not have many varieties of squash in the markets where I live in Finland but I will keep an eye out! I am really enjoying your recipes! >Long-distance is tough, even for short periods of time. Even though my hubby and I lived in the same state (much less the same country) for only a few months of our 6-year relationship before getting married, it was SO tough. I would struggle with it more now that I know what it's like to have him around all the time. If that even makes sense! These squash look delicious! I love acorn squash but to be honest, the only way I've had it is plain or slathered in butter, brown sugar, and pecans. I'm anxious to try this savory recipe! Thanks! >@ Nicole – The first few weeks are always the hardest and I think it's because, like you said, we are used to having each other around. It never gets "easy" I guess it does get a little easier. And you must try this savory version. The initial roast with the garlic butter really pumps up the flavor in the squash! 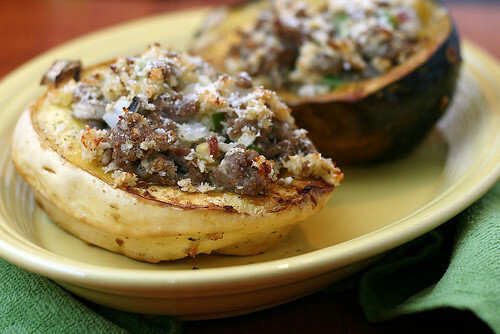 >I loooove stuffed squash recipes and this one, with sausage and apple and all the mushrooms, seems like a real winner. We also have had an Autumn that's been warmer than the summer over in the UK – its very strange! >You're right! 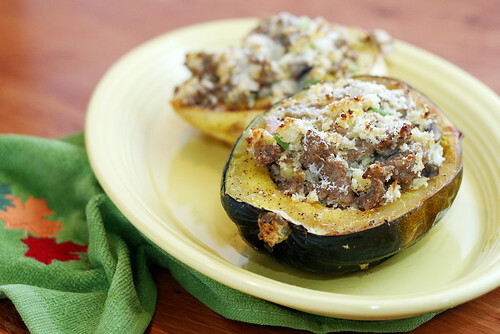 This stuffed squash has a winning combination of ingredients. Great photo too! >Beautiful! I need to bookmark this for next week. >i found your recipe on foodgawker & made it tonight. it was a hit! definitely going on our "make this again" rotation. i'm in texas & today was our first day of decently cool weather- this was the perfect celebratory meal. and i agree, the apple is great in the mix. thanks for posting!! >Looks delicious. Would love for you to share your pictures with us over at foodepix.com. I randomly found this recipe and made it recently – delicious!! Thanks for sharing it! Picked up some pretty acorn squash at the farmers market with this recipe in mind. I’ve fixed this recipe before and we liked it but I didn’t leave a comment. Since the dish is making a repeat appearance, I thought you would like to know. Thanks for sharing!